Serena Cant works as the specialist maritime data officer, maintaining a database of over 37,000 wrecks to help inform English Heritage’s designation strategy on historic wrecks. As well as updating records with the results of professional archaeological assessments, she writes extensively on maritime heritage and also deals with public enquiries. Here she explains some recent exciting discoveries which have come to light following contact from members of the public. I’m passionate about what I do: shipwrecks illuminate so many different aspects of our heritage that I learn something new every day, even after 17 years in the role. Besides the obvious naval and military history, maritime archaeology involves connections with monuments on land (churchyards, memorials, shipyards), reveals the ebb and flow of our trading connections overseas, and shines a light into forgotten corners of documentary records. There is a huge appetite for maritime archaeology; commonly we are contacted by local historians and genealogists, divers, and local residents, who are often the first to spot when a wreck has suddenly been revealed on the foreshore. Many members of the public get in touch to offer information on wrecks in various ways: via PastScape, our Maritime Archaeologists, or other agencies with an interest in wrecks, such as the Receiver of Wreck and the United Kingdom Hydrographic Office. 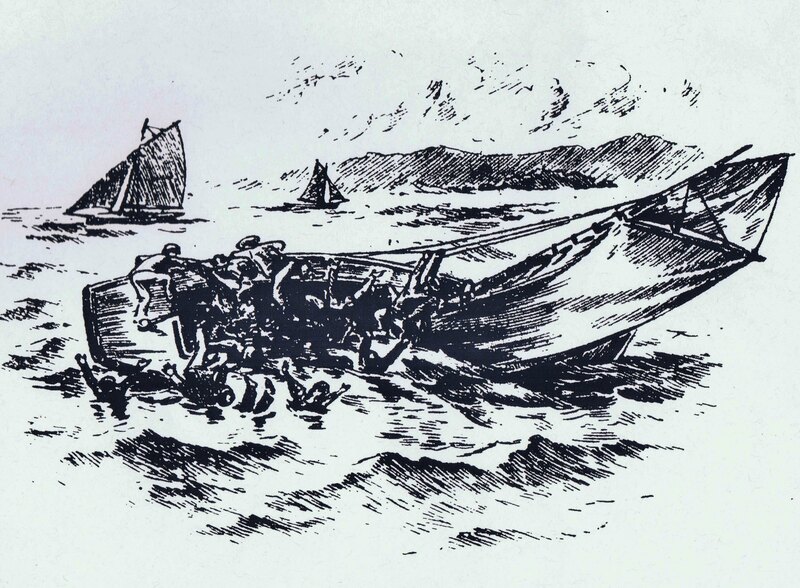 A recent PastScape comment revealed that there was much more information concerning the loss of a small fishing boat in Morecambe Bay in 1894 than had hitherto been realised. The informant was researching the story of the loss of the Matchless, a fishing boat which capsized and turned a summer pleasure cruise into a tragedy. The effects were felt across the Pennines in the Yorkshire mill towns from which the holidaymakers had come, and revealed an important aspect of social history which will feature shortly on my blog. Sketch from the Lancashire County and Standard Advertiser, 7th September, 1894, as drawn by an eyewitness to the Matchless tragedy. Divers also offer information on wrecks within 12 nautical miles, which is the international limit of territorial waters. 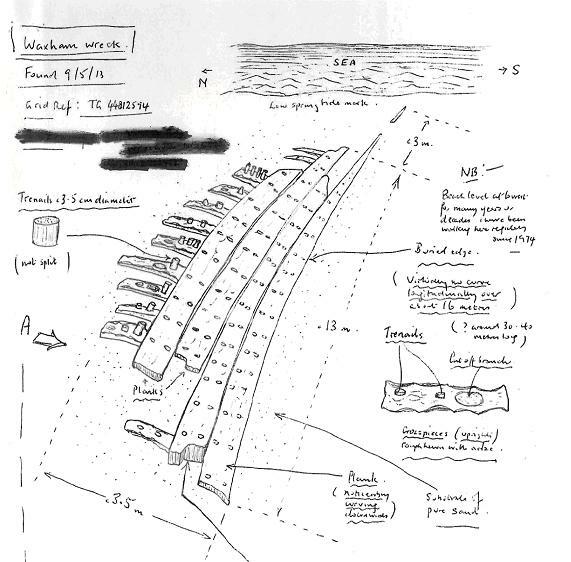 Recently a Falmouth diver, Mark Milburn, approached our Maritime Archaeologists, for help in identifying a wreck he had seen with a very specific granite cargo. I was able to search the database for records in the area in question, and offer some suggestions as to which wreck she might possibly be. This particular wreck was fascinating as the question of her identity pivoted around the particular type of stone she was carrying – improving my understanding of geology! The ensuing discussions on the granite wreck widened out into other wrecks in the vicinity and have already helped us improve the records for wrecks in the area. Mr Milburn is a committed diver with considerable local knowledge, including a historical appreciation of the settlements in and around Falmouth, which has shed light on our records, not least in the fate of U-boats following surrender after the First World War. In fact, the information offered is sufficient to become a targeted enhancement project in its own right: certainly a mighty oak growing out of the little acorn of that initial contact. 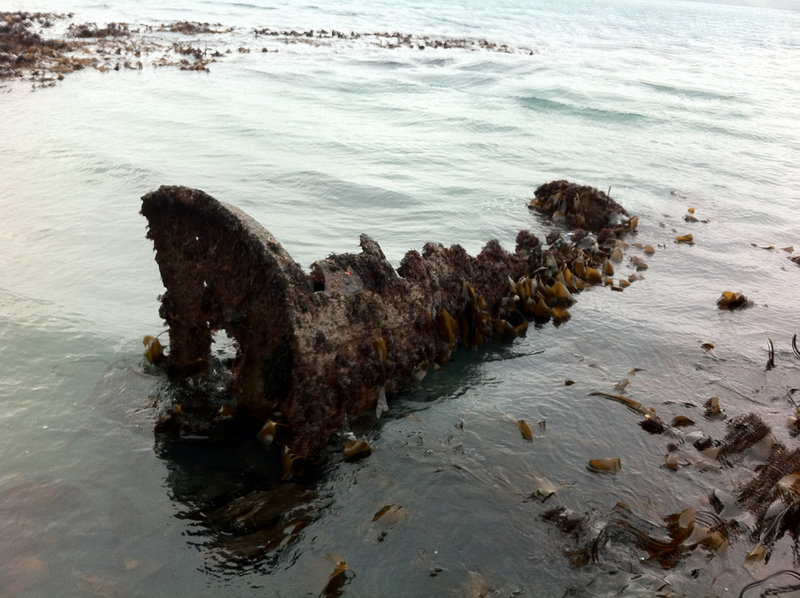 What remains of UB 86 at low spring tide, Pendennis, Falmouth, surrendered along with a number of other U-boats after the First World War. © Mark Milburn. The Receiver of Wreck also contacted me recently concerning a report made to them by a Norfolk resident, in the hope that I could assist in identifying his find. He had walked his local beach for many years: when he spotted timbers he had never seen before, he recognised that he was looking at a wreck from which the covering sand layer had been scoured off exceptional recent tides. He created an exemplary record of the wreck in situ with careful measurements and a description of its exact location, realising that it might well be covered again within a few days (as indeed it was). A number of wrecks seem to have been uncovered this way this year on the east coast, showing how wreck reports can reveal trends which vary from year to year. At this stage I could do little more than offer some potential suggestions for its identity but I was able to create a very complete database record from the sketch: it alerted us to a wreck hitherto hidden from view and thus from the public record. These are but three examples of recent user-generated material which complement the professional reports and investigations to make our database increasingly a ‘one-stop shop’ for wreck information. The database is dynamic and continually being enhanced, updating existing wrecks, making identifications and adding new sites. I hope in turn it makes the reader as passionate as I am about our maritime heritage! Serena Cant is the author of a new book, England’s Shipwreck Heritage: From logboats to U-boats. It was amazing that the week I published this we started getting in a few reports about this wreck being uncovered again. English Heritage and other interested agencies are working together to record this wreck and see if we can identify it.